NaturalCureDoctors.com is in Newport Beach, Orange County, California. Dr. Robert Janda, MA, Doctor of Chiropractor, specializes in Natural Healing, Traditional Naturopath, Naturopathic Healing, Low Back, Neck Pain Treatment, Fibromyalgia Treatment, Spinal Disc Pain Treatment, Ruptured Disc Treatment, Bulging Disc Treatment, Slipped Disc Treatment, Non-surgical Spinal Decompression Treatment, Carpal Tunnel, Auto Accident, Shoulder Pain, Muscle Spasm, Neck Pain, Low Back Pain and Applied Kinesiology. Dr. Janda also specializes in Active Release Technique, Gentle adjusting, Arthritis, Massage Therapy, Flexion Traction Manipulation, Supportive Physical Therapy and Rehabilitative Exercise Programs. New Release Book is Available Now! Hard copy Book is Available NOW! Dr. Janda, you are an inspiration! I am so truly grateful to your for all you’re doing to help me heal once and for all! I can’t express in words the gratitude I feel for you and your giving heart! At age 92, I credit much of my good health to my chief health consultant, Dr. Robert Janda. He uses a number of effective techniques to discover and treat various physical problems, and he has also sent me to other excellent doctors from time to time. He has my deep appreciation and I am pleased to recommend him. I just finished reading your book. I thoroughly enjoyed it, and I found it filled with loads of insightful information. I think that the explanation of how dysfunction is related to pain and then to disease is very important to health care in general. Things such as stress, persistent inflammation, symbol deprivation and diet have been neatly tied together in your book. I tend to think that this book needs to be read and re-read for better digestion. It can also serve as a reference manual for people to better self diagnose the Secret of their own Pain. P.S. thank you again for your passion for healing, and for all the wonderful insights. Through the way you have been treating me with patience, listened to my every complaint, and have been communicating, my body is healing from the inside out. Your determination and your compassion have given strength to my bones ……I thank you and appreciate you in every minute of my life. I continued to see him for various reasons, including nutritional advice. He is by far one of the most knowledgeable practitioners in his field. I learned so many things, simple things, to heal myself. I love Dr. Janda for helping me be healthy. And his bedside manner is exceptional. I have recommended him to many of my friends. He is all about helping people be the healthiest they can be. Thanks Dr. Janda! Dr. Janda is the most sensitive Kinesiologist I have ever met. This gift gives him the ability to diagnose all kinds of problems quickly and accurately. Coupled with his extensive knowledge of how our bodies work and the roots of the pathologies we encounter, he has been able to help me through numerous difficulties, large and small, over the years. He's the number one defensive tool in my health kit! I had a pain in my shoulder that prevented me from raising my right arm, to the point where I hardly moved it at all. Dr Janda, using his Rolfing method, completely healed that. I had had this pain for almost a year, and it has not returned After 7 years. Dr Janda is a walking encyclopedia and a perpetual student. When I met him he was a Chiropractor who was effective with Applied Kinesiology. His ongoing search for knowledge and his keeping up with new methods and advanced technology make him a very valuable health care provider. I have played tennis for many years and was starting to suffer from tennis elbow. In the past this would have meant a long time of rest and no playing. I decided to see Dr. Janda about it, as he has helped me so many times with other issues in the past. In one session the pain was relieved, tennis elbow gone! I was back on the courts the next day! I make my living as a faux and decorative painter. I was so worried one day when I had some strange nerve anomaly in my wrist, leaving my hand weakened. I didn’t know if this would affect my ability to work. The next day I saw Dr. Janda. I was a first time patient. I had a warm welcome and then he started evaluating and working on my hand. In all of 5 minutes my pain was gone and I was out the door. A little miracle. If you can call miracles little. Thank you Dr. Janda. 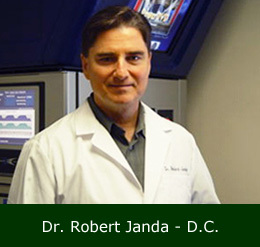 In my opinion, Dr. Janda is the very best in his field. I am constantly amazed at his ability to quickly zero-in on the specific problem area and administer the exact treatment needed. I am so grateful to have found such a wonderful and competent Applied Kinesiologist. Dr. Janda displays a very non-conventional approach to the field of holistic medicine. I have gone to many holistic doctors in my life and have a very large field of comparison. Dr. Janda’s level of presence as well as his awareness of his patients is very detailed and effective. His quality of listening, his awareness of symptoms and his ability to address these items is very rare. His diagnosis and treatment is so effective that at first it makes you skeptical that it could be true-- but then the results come quickly. Take, for example, my chronic bladder infections. I saw numerous medical doctors over a long period of time and could never really cure it. With Dr. Janda’s treatment there was and immediate and abiding effect. It was really hard to believe and it was so freeing that it could be so simply treated. His power of knowledge, diagnosis and treatment is so effective that I bless him.